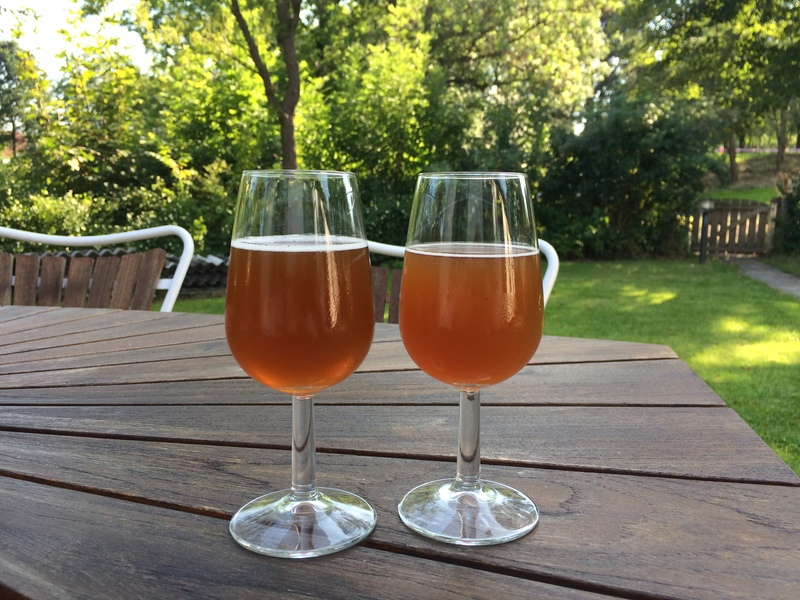 The Bride Blond recipe I made in May/June turned out to be a very crispy, nicely fruity and a little phenolic tasting Belgian Blond style beer. At that time, I was asked to brew a beer for a double 70 years birthday party, so I decided to brew another Bride Blond beer, but adjusted the recipe a little bit to get more foam in the glass and to have an even lighter beer (in alcohol and maltiness). One thing you can do is to add wheat in the malt bill as that will give you more proteins that together with the hop phenols will give you a stable foam. Another thing you can do is mashing at higher temperatures to get more maltodextrins in your final beer which will also help stabilizing the foam. Therefore I bought some body enhancing maltodextrins which you can add before bottling. I am still not sure if I will use those or not. The color and flavor of my first trial were good, but I still wanted a little less maltiness in the final taste, so that is why decided to add wheat and more oat malt. The malt always smells amazing after milling. Then it was time to brew, so I used my favorite Braumeister again and this time brewed only 20 minutes at 63 degrees Celsius and 50 minutes at 73 degrees Celsius to get more maltodextrins in the wort. For the hops, I also changed the recipe to get a little extra citrus flavor. I used Mittelfrüh as bittering hop and Mittelfrüh + Citra as aroma hops. I love Mittelfrüh for bittering as it is a very delicate hop with a balanced bitterness. Also as aroma it gives you a fruity, spicy and citrus aroma (source: https://ychhops.com/varieties/hallertau-mittlefruh). Citra is very know to give a citrus and tropical aroma. 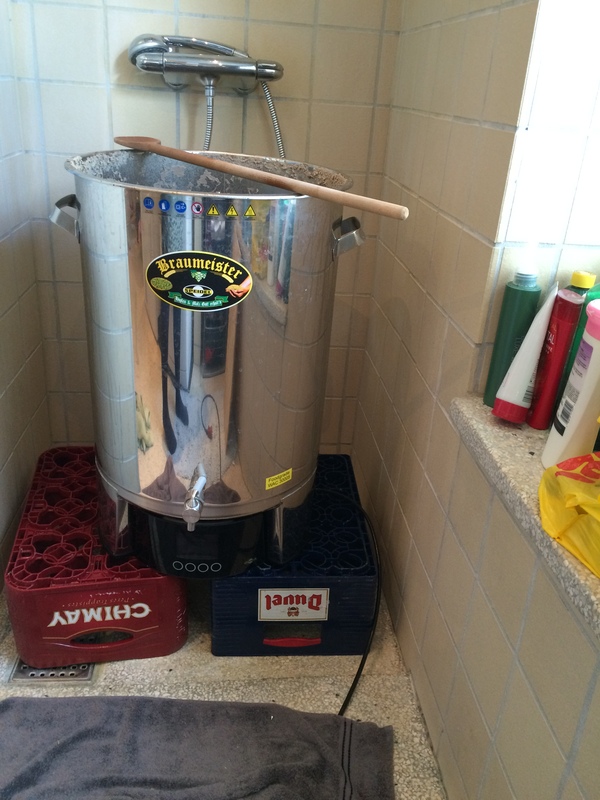 After brewing, I filled the fermentation buckets and managed to get around 35 liter final volume, meaning around 32 liter final beer. 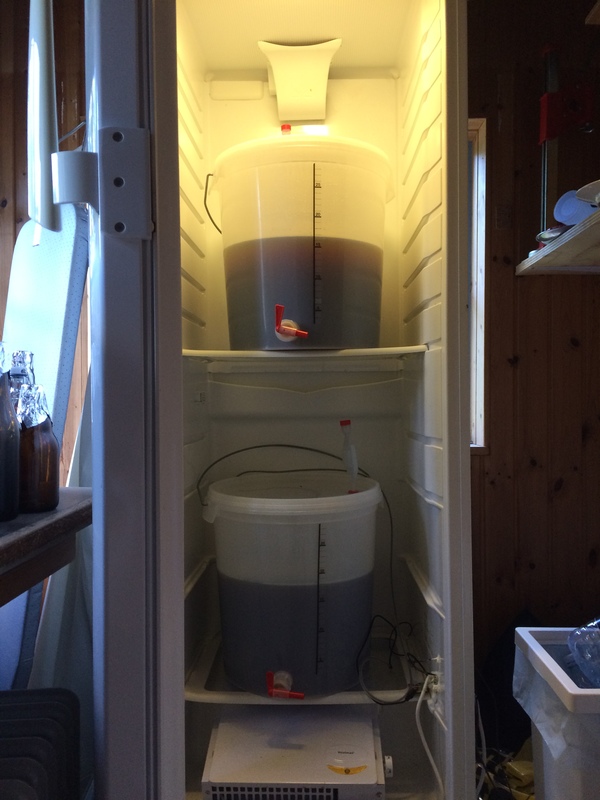 After filling, I cooled down the two fermentation buckets until the next day. I made a yeast starter with 5% light malt and the WLP570 Belgian Golden Ale yeast. 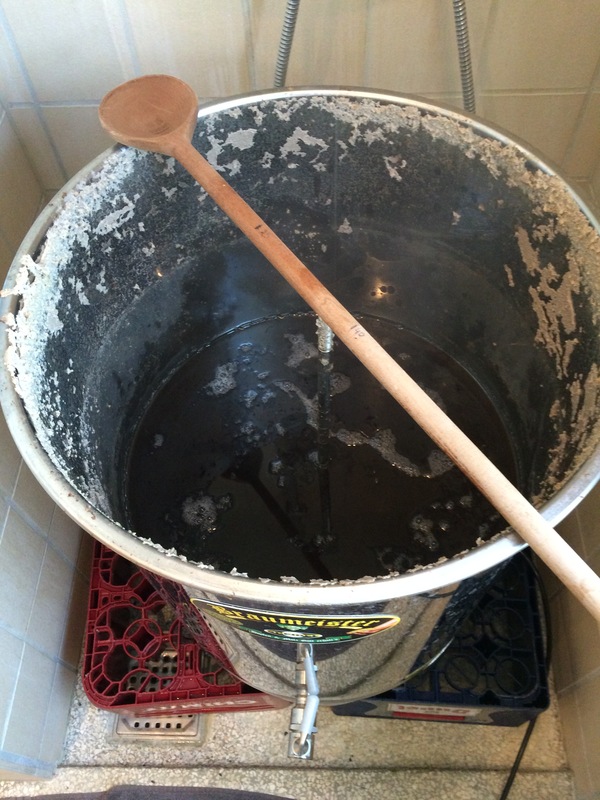 I used one sachet per starter to make a fresh starter for every bucket. After overnight culturing the yeast, it was happily bubbling away and I added the starters to the fermentation buckets. I did this in the morning and in the evening, I had happily fermenting buckets :-). This time I also aerated the wort before I added the yeast, with a small pump and a stainless steel filter. I aerated for 30 minutes before adding the yeast and I could clearly see that the yeast was very active the next day. I have now 4 hop varieties in my garden: Cascade, Saaz, Styrian Golding and Chinook. I ordered the rhizomes in December 2014 and planted them in March 2015. The first year I did not expect a big harvest, but I have to admit that I got quite some nice hop bells in September 2015. Especially the Cascade had given quite a good harvest and I used that hop fresh in a hoppy saison version (Saison Maison) as aroma hop in the late boil. In 2016 I got some ‘real’ harvest and also used that one in some of my beers, but then as a dry hop. I air-dried the hop bells and then used them in the boil. I actually bought a herb dryer now to make sure I have a good quality dry hop which I can vacuum pack afterwards. But that is a story for another time. I tried all three of the ways but only succeeded in the last two. My first attempt to multiply the hops by taking rhizomes did not succeed as I believe my plants are not old enough and it is quite difficult to find the rhizomes under the ground. I also was affraid to harm my hop plants in this way. That is why I tried the two other options as soon as the first shootings came up. I read that the first shootings are hollow and therefore will break easily when the hops bells are forming in late summer. That is why you need to cut them out to let the next round of shootings survive and take over. They are much stronger and therefore better suited. They are also giving more yield. After I had cut the first shootings, I tried the method of putting them into water and let them root. It took at least three weeks, but after that, the shootings clearly rooted. It took another month before they really started growing wild. I was so happy to see this :-). Now I only need to plant them out and hope they are growing. I also tried the second method, trying to immediately plant them in fresh earth. I did not think this method would work, especially because I had 6 seedlings, but only two survived. However, those two are also growing after at least 4 weeks of waiting. Two hop varieties decided to root: Saaz to the left and Cascade to the right. So, yes, it is possible to multiply the hops in your garden. It is actually quite easy. Just take the first shoots and put them either in water or in fresh earth and off they go. I hope now that my friend can use them and that they will form beautiful new hop plants giving delicious hop bells in autumn :-).